Land of Fire is preparing to bring national pomegranate to new export markets in Europe. Azerbaijan plans to export pomegranate to several European countries, Executive Director of the Azerbaijan Pomegranate Producers and Exporters Association Yusif Akhundov told Report. Akhundov stressed that negotiations are underway on export to Latvia, Poland and France. 'The quality of the products is a very important issue for these countries. In this regard, local producers are working to improve quality. The export of products to these countries is expected in September, he noted. Akhundov added that last year, 180,000 tons of pomegranates were produced in Azerbaijan. Products worth $ 13 million were exported. During the first three months of 2019, the pomegranate has been exported in small quantities. Main export destinations were Russia, Ukraine and Kazakhstan. He also touched open the pomegranate processing plants, noting that establishment of businesses is planned in Aran districts. So far, this issue is under discussion. The Pomegranate Producers and Exporters Association was established on October 31, 2016. Today it brings together 26 members. In 2017, 165,000 tons of pomegranates were produced in the country, while the export revenues for 2017 amounted to $10 million. Pomegranate is a national fruit that plays a big role in the development of non-oil sector in Azerbaijan, both agriculture and tourism. Azerbaijan's national brand pomegranate has received worldwide recognition as one of the best for taste and quality. Azerbaijan is considered the only country where all varieties of pomegranate grow. About 70 varieties of pomegranate were spread in Azerbaijan, while about 20 varieties are grown in Azerbaijan today. The varieties Gulovsha, Vesel, Shandi, Shirin and Bala Mursal are mainly cultivated in local gardens. For the further development of pomegranate production, measures to cultivate new varieties and create new gardens are being taken. Goychay region is distinguished for the pomegranate cultivation in Azerbaijan. Since 2006, traditional festivals of pomegranates have been held in Goychay region every year. It serves to promote the Azerbaijani pomegranate that has become a cultural and tourism symbol of the country. Pomegranate is not only economically profitable, but also of great importance for human health. Pomegranate juice and peel are used in the treatment of up to 20 diseases. Pomegranate rind, as well as oil from its seeds are used in cosmetology, pharmaceutical production. 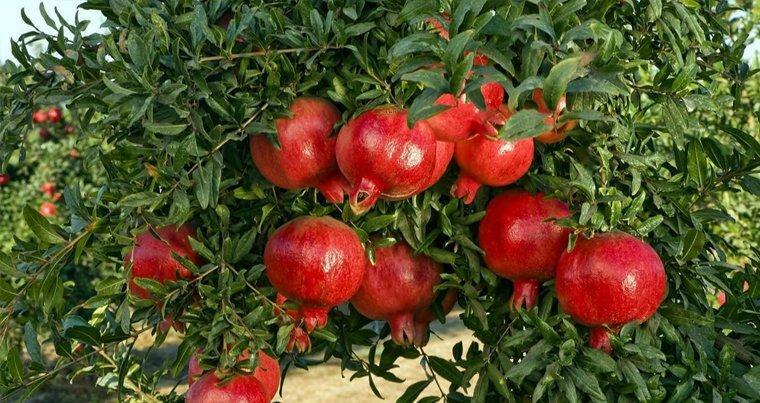 This year Azerbaijan plans to begin construction of a large complex for the production of pomegranate products. The complex can be built in one of the industrial parks of Azerbaijan. It is planned that the complex will consist of four enterprises for the production of pomegranate juice, concentrate, processing of pomegranate peels and seeds. The total cost of the complex, according to the business plan is 25 million manats. Construction is scheduled to begin in 2019 and be completed by 2021.